Charise Creates: Christmas in Paris & A Little give-away! 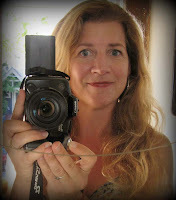 Today is my day in the Thinking Christmas Blog Hop hosted by the lovely Lesley. I designed a paper piecing block that is a stack of presents I'd like to receive. While picking the fabric - A Christmas in Paris theme emerged! I would love to spend Christmas Holiday in Paris - wouldn't you? Sipping Chocolat Chaud on a chilly winter day. Then a walk along the Seine : ) And the shopping would be divine!! Penelope- Salon de The' Paris by Holly Holderman for LakehouseDryGoods.com. I LOVE the Holly Holderman print! There are so many wonderful motifs and it translates to Christmas so well even though it is a tea theme fabric! I'm also hosting a little give - away!! One winner will receive my gifts pattern, one other pattern of their choice from my shop, and a F8 bundle of the fabrics shown above. I will pick winners on Sunday Morning - Aug 5th. . Please leave a comment by 12:00 p.m. Pacific Daylight time Saturday August 4th. If you would like to purchase the Gifts pattern, I will have it listed at half-price in my Craftsy shop until Sunday evening 12:00 p.m. Pacific Time! I have a button on my side bar you can click on to see the entire list of bloggers on this hop! Charisse, your block is just so elegant, and yummy, and delicious, and wonderful...I can just picture myself sitting in a little cafe absorbing the sights and smells of sipping chocolate! Thanks so much for creating this great block and offering a wonderful giveaway. I guess if I could be anywhere at Christmas, it would actually be home with both our children with us, watching Christmas movies about places far away! Your block is amazing! Lovely colours. If I could be anywhere at Christmas, I would definitely go somewhere hot. Australia (to visit Bondi Beach on Christmas), The Gambia is also a strong contender, I am part of a project there and would love to spend Christmas with the kiddies. The fact that it is nice and toasty there also helps! Thank you for the chance to win your fabulous giveaway! I'm probably boring - at home with DH or wherever he is - the only other option with be Christmas with DH and my parents. Love your paper pieced block - PP is always to crisp and perfect! Christmas in Yellowstone National Park, lots of snow and a one-horse open sleigh to ride in with my DH! Along with at least 8 other cabins filled with the rest of the family! Anywhere out of town! I live in a small town, so it would be like Christmas and my Birthday all rolled into one. Love the presents and how you presented them on you quilt. Oooh I love your quilt - very parisian! I can honestly say that Paris in Winter is fabulous - especially when it snows on the Champs-Elysées - very pretty. I love all your patterns they are great. Thanks for sharing. Oooh forgot to say I would love to spend Christmas at Disneyland California! Oh another beauty Charise! Such a pretty and elegant stack of presents who wouldn't love to find these under the tree!! I would love to spend Christmas in a winter wonderland like Scandinavia as I live in sub tropical Queensland. Love your block and fabrics. I live in Italy ... and my dream .... is spend Christmas in New York. Love your paper pieced block,very pretty colours.I'd love to be spending Christmas in my own home just me,my hubby and our dog Belle going on a picnic beside the river for lunch sounds devine after such a hectic year :) Barb. Lovely giveaway! I would spend Christmas in either Paris or New York- especially if it snowed! Living down under, that would be so special and unique! It would have to be Paris - I would love to maybe experience a white Christmas as I live in Australia! Chocolate in Paris - yum. 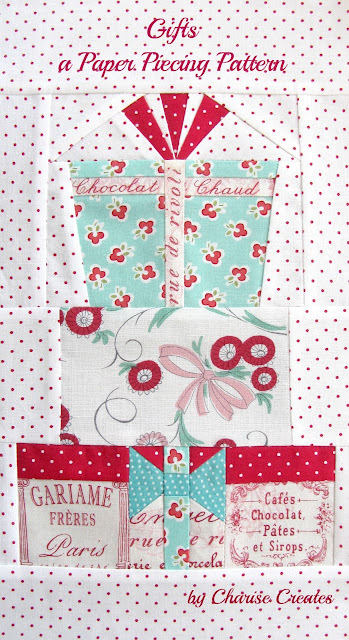 Love the paperpiecing on the dotty background, the fabrics & stacked presents is wonderful. Charise, Christmas is in the warmth/heat of Australia. Thank you for the giveaway. I've become a follower & be back to look at Pinterest. Gorgeous! I want to go to europe for christmas, i bet it will be fantastic! Not one to go down the 'what if' trail often....but 'if' I could spend Christmas anywhere in the world.....it would HAVE to be in the stable, in Bethlehem, over 2000 years ago with the shepherds. If I could spend Christmas anywhere in the world, it would be right here at home! I LOVE Christmas at home! 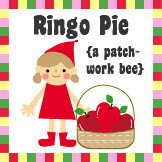 Thanks for the chance to win---I've never done any paper piecing and would like to give it a try. Your work is beautiful. Thank you for sharing today. I would spend my Christmas wherever my kids are. Love your pattern and fabric choice, as always! May sound awful, but I'd love to spend Christmas in Heaven with my family. Thanks for the giveaway! I would love to spend Christmas on the beach in S Australia, as long as I can take my family with me! Love this gift pattern. Maui would be a wonderful place to spend Christmas - get all my family together there. Thanks for the chance to win. I love tea! this block is gorgeous. IF I could spend Christmas anywhere I think I would choose Paris! If I could spend Christmas anywhere (and bring my mom, brother, SIL, and our fondue tradition), I'd probably pick Hawaii. Like many people I want to spend Christmas wherever my family is. This year I hope it will be in the town our son has recently moved to -- 900 miles away! We're working on a plan to make that happen. Oh my gosh, this is a fabulous giveaway! Thanks so much for the chance, I just love your patterns and that fabric is wunnerful! I really love Christmas morning in my own home with my family. We have some fun little traditions and it is one of my favorite times. PLan B would be Christmas in Vermont. I just love those Green Mountains! As always your blocks are utterly fabulous! This year we are spending Christmas at home for the first time in years, and it's perfect! I would spend Christmas with my family. Since I live in another country then them I have not spent Christmas with my whole family in over 30 years. Thanks for the giveaway! Your block is fantastic, love the fabric! If I could spend Christmas anywhere, I would love to re-live Christmas at my Grandparents farm, I have wonderful childhood memories of many wonderful days spent with them. Thank you for the opportunity to win such a wonderful giveaway! Charise, this is adorably cute. If I could spend Christmas anywhere I would love to take all my family somewhere that it snows. Living in Australia, Christmas is usually really hot and all those movies of 'white Christmases' seem so unbelievable. We would love a 'white christmas. oh my god!!! beautiful... you got me now i follow you with bloglovin! well what else to say love the block, love the fabric everything's beautiful. Christmas holiday will be great in Paris (but honestly... i went few years ago for chritmas.. was cold and rainy.. no garden.. well not THE paris in my head!) I'm from canada so for me christmas have to be with snow so i'll say sweeden or ireland for christmas! thank's for the giveaway, hope to see you on my blog sunday! I would love to spend Christmas with my husband and children (grown now) in a resort in the mountains, where you could enjoy the snow and winter beauty , but have no shoveling! LOVE your gifts block and fabrics!! So wonderful block and fabrics,love.I`d love to spend Christmas here,in Spain,with family and friends.Thanks for the chance to win. Beautiful block with beautiful fabrics . I would spend Christmas right here at home with all my sons and family if that were possible. Thanks for the chance to win . enjoyed having you share with us today. Anywhere in the world? I would still want to be right here at home in Pennsylvania for Christmas. A few inches of snow would make it perfect! Wow, you are so incredibly talented...love to always see what you have designed. Two years ago, spent Christmas in Germany because my daughter and her husband were stationed there. Christmas in Germany with all the outdoor Christmas markets, and beautiful churches, and nativity scenes everywhere you look....hard to beat that! Would love to win, thank you so much for sharing! Would like to spend Christmas in New York with plenty of snow. Those fabrics are so pretty and unique - Love your packages block - have not tried paper pieceing - that is on my list. I would spend my Christmas right here at home where it is a warmer climate and we wouldn't be snowed in, but being selfish I would want ALL of my family to spend it right here with me to make it the perfect Christmas. I love the holidays where you are surrounded by family and have a great excuse to make ALL of the foods and cookies and treats you remember from growing up. As always your block is fabulous. I would enjoy spending Christmas is the Swiss Alps surrounded by snow and spectacular scenery. If I could spend Christmas anywhere, it would be at home with my family! Thanks for the giveaway! I would love to spend Christmas with my far away brother in Australia and see what it is like to have Christmas in the middle of summer. I love paper piecing ~ you have some gorgeous patterns! I would love to spend Christmas with my family in St Cloud MN! I would love to spend it in a snowy, European village with my family. I would love to spend Christmas with my son in Myrtle Beach, SC. I love paper piecing. Very cute and lovely block! I would spend it in Japan. I love the country. Such a great block. Love the soft and pretty fabrics you used. Christmas, why at Disney World the happiest place on earth! 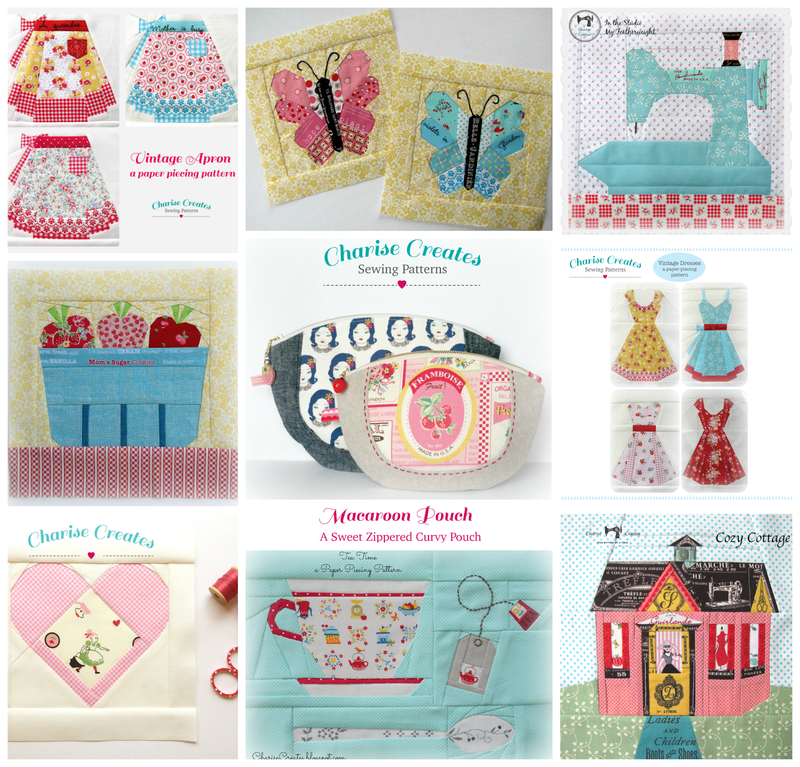 Very cute paper pieced gifts...and your choice of fabrics is lovely! I would love to spend Christmas in Norway! Christmas anywhere in the world? My grandmother's house in 1968. Of course, if you don't believe the time-space continuum is bendable like that, I would be perfectly happy to spend Christmas in my own home with my husband and children. Love those pretty fabrics. I'd spend Christmas anywhere as long as I'm with my family. To be honest - I would just choose to go to my Mom's house to be with all the family, but the day AFTER Christmas, I would love to head to Ettal, Germany which I think is the prettiest place on earth! Paris would be fun for Christmas, but I am thinking about Italy where my comes from and she and her sister have a rental in Italy. How cool is that? Your paper-pieced gift is just darling and you, my dear, are a very talented lady. You are spoiling all of your followers with your awesome giveway. This is like to die for kind of gift. Thank you so much and for giving us all a chance to win and to make this Think Christmas blog hop one to remember. Oh....so pretty! I just love your paper piecing works. I would love to spend Christmas in a snowy chalet in Switzerland someday. I'd love to go to the Grand Canyon and stay in one of the lodges near the canyon, of course it would have to be a year that they have snow there, which is so lovely at the canyon. We would have all our kids and our granddaughter with us, a roaring fire, a huge tree, and of course Christmas carols playing in the background. Awesome giveaway!In the mountains..Estes Park or Boulder, Colorado! You do lovely work and those fabrics are perfect! I would like to spend Christmas in a cabin somewhere in the mountains, maybe the Smoky Mountains or somewhere in Colorado. I've got a problem with blogger, I can't leave a comment, I can only reply if the comments are embedded - I hope this is OK! cute idea for your block. I would spend Christmas right here with my family. I'm not much for travel. Thanks for the chance to win. I love your presents block! If I could spend Christmas anywhere it would be home as long as the whole family was there. I don't know that I would want to spend Christmas anywhere but home with my whole family. Christmas conjures memories of home, baking and plenty of family time. Hmmm... great question! I have lived a lot of places so I have experience being elsewhere for Christmas, but I think I am going to say Australia... I don't think I would want to do it more than once, but I am curious what it is like. Even though I have had green Christmas's in Barbados, it wasn't the same thing as it was still technically winter. oh, i love your gifts pattern, it is so sweet! I would love to spend Christmas at home -- in prescott, arizona, with my mom, grandmother and brothers. just one more time, for just one second -- that would be the best! I would love to have my whole family ( that's in Canada ) come here and spend christmas in Germany with me. I would love to show them the christmas markets and all the delicious foods not to mention the baked goodies . I would love to go to Germany for Christmas. Being from Mid America, that would be quit an experience for me! Paris would definitely be my first choice too! I've been to Paris twice, once in Spring 1998 and again in summer 2005 and I loved it but I always wondered what it'd be like walking along the Champs Elysees in the winter with the crunch of snow and the smell of cold mixed with un chocolat chaud or un cafe au lait. 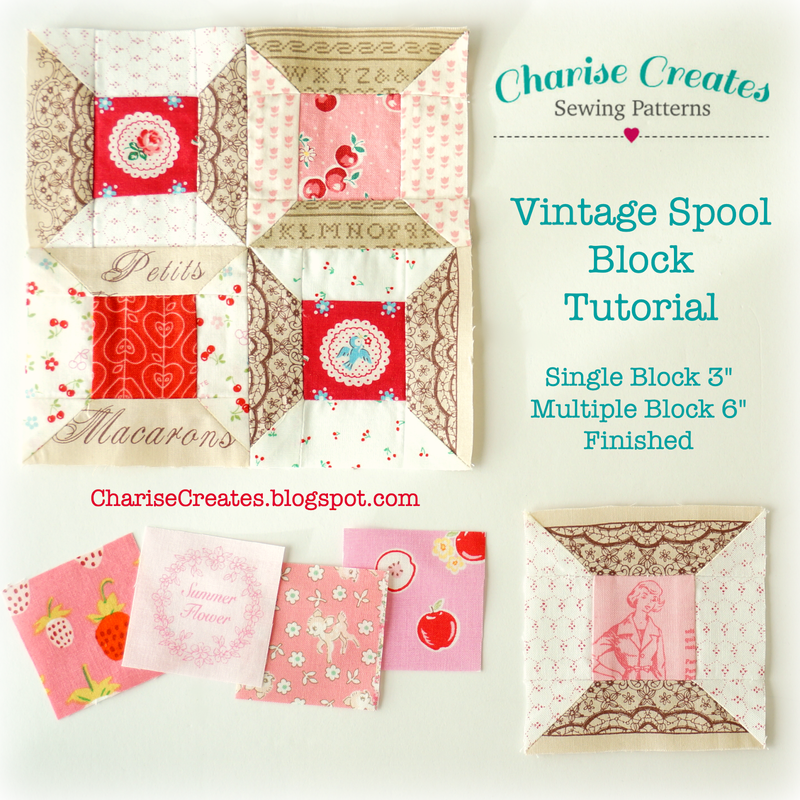 Thanks so much for sharing this fun block and I ADORE the fabrics! Ps. I also became a follower!!! I would be happy to spend Christmas anywhere as long as it is with my family. Add extended family and it's even better. 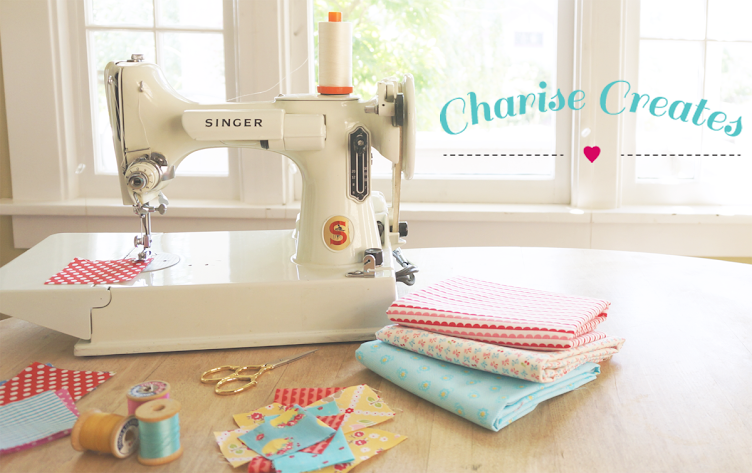 Charisse, what a beautiful pattern! Love all the presents and the fabrics you choose are perfect! If I could spend Christmas anywhere it would be in Aruba. We went there a couple years ago over New Year and it is beautiful! I would love to spend a Christmas in Germany or the Swiss Alps. I'm from the Mid West & live in CA so I miss the snow at Christmas. Oh...Christmas in Hawaii, the island of Maui. Those do look like wonderful gifts!!!! Well for Christmas I would always prefer to spend it at home!!!! But right now a vacation in Alaska might be nice uh wonderful!!!! I would love to spend Christmas in England. Love the thought of old cathedrals, wassail, and antiques. Just seems like the perfect place. Very cute pattern by the way. Thanks for sharing. I love your block and I love Paris. Been there several times. But if I had to choose, I think I would spend Christmas in the mountains where it snows. As long as my family were there too. Your block is sweet. If I could spend Christmas anywhere in the world I would spend it in Germany with my father. Lovely blocks, just so lovely. I think Germany would be my first choice as I love Father Christmas figures and I bet there are many there. I would certainly enjoy Paris; I've heard it's actually a reasonably priced trip at Christmas time. 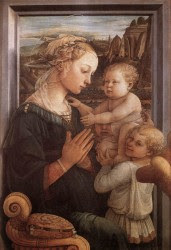 Thank you for the chance to win any of your wonderful offerings. I'd love to spend Christmas in Sweden, my grandparents were Swedish and I have cousins there I've never met! Thanks for sharing, and for the chance to win! HELLO! YES,PARIS WOULD BE WONDERFUL,BUT I'D BE HAPPY WHERE EVER MY LOVED ONES ARE! 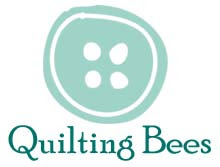 THANK YOU FOR SHARING A SWEET LITTLE QUILT+GIVEAWAY! What a wonderful block. It truely looks like a stack of wonderful gifts. I love the block! Paper piecing is my favorite way to piece - glad to have found you :o) I'd spend Christmas (if I could spend it anywhere) in Lake Tahoe. We had a house there when we were kids and I remember one year we actually got snowed in! I miss the snow, since if it snows at all here in the Willamette it usually happens in Jan/Feb. Thanks for the giveaway - I'm a follower now too! Would love to spend Christmas in Fort Simpson NWT with my children and grandchildren. So different and so beautiful! LOVE! Charise - It doesn't matter where i spend Christmas, but I would like to have my girls with me. My older girl who is single and works in a hospital usually works so the married/those with children can spend the day with their families. My other daughter and her husband take turns spending the holiday with us or with his family. What is the name of the fabric and who makes it that you have pictured? 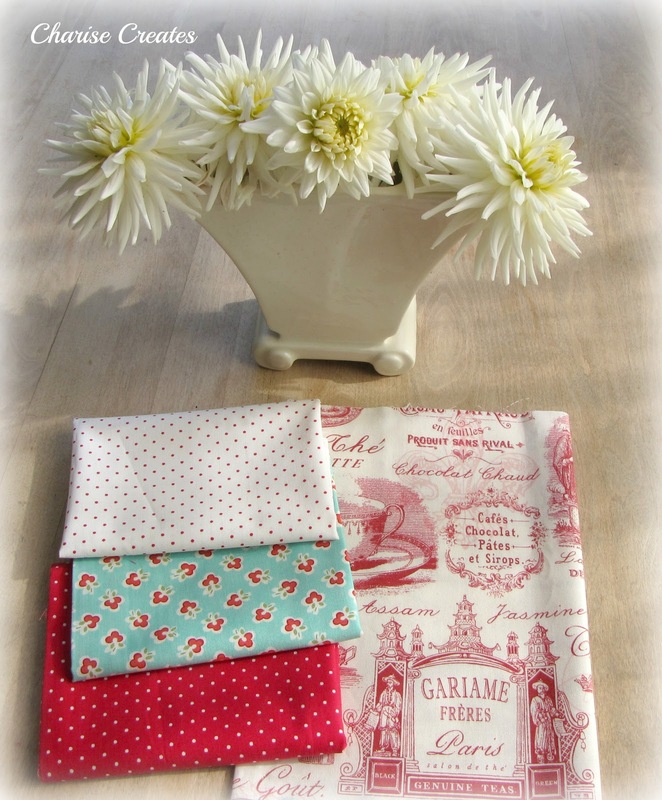 I have a cousin who loves anything French and that red & white fabric would be perfect to make something for her. I just love your paper piecing, You are so talented. Thanks for the opportunity to win. I would love to spend a Christmas in germany for the street fairs. I think that would be a perfect Christmas Holiday away from being at home. I'm pretty boring. I would be spending Christmas at home. Paris, would love to spend a Christmas in Paris. I would love to spend Christmas in the mountains with snow! Of course, all my family would have to be there! Your gift design is absolutely adorable! I think that Norway would be a wonderful place to experience Christmas. I live in Minnesota, so the snow wouldn't be anything new, but I've always had an affinity to Scandinavia. My high school had an exchange student from Norway and she was so nice. The culture there is different from the U.S. They seem more low key to me. It would be a relaxing way to spend the holidays. 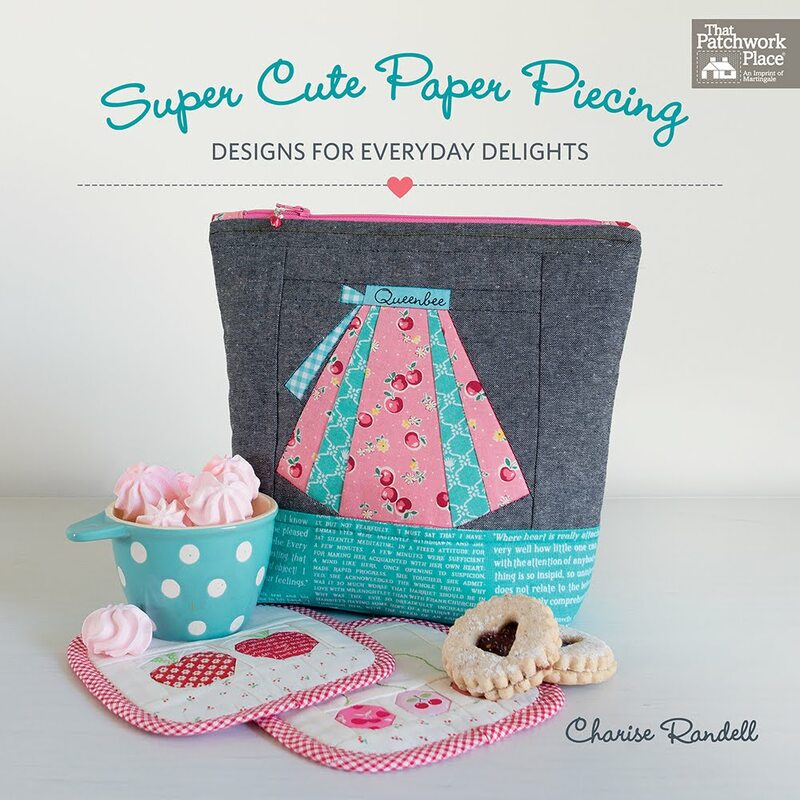 Charise, your paper piecing are always marvellous I really love your patterns, cute but modern at the same time :). If I could choose a place to stay at Christmas, will be a little cottage in Golden Valley, with my hubby and my baby (This december!!!!). I would love to spend Christmas in New Zealand with my family! Wow! That is such a pretty block! If I could I would love to spend Christmas I the Great Smokey Mountains with all of my family. Thanks for the chance to win such a great package. Your stack of gifts is such a lovely pattern, but then all your patterns are great. I love white Christmas and my first thought was somewhere in Scandinavia, but now I think more of my home town in Polish Tatra mountains - haven't spent Christmas there since I was 11. On the other hand, Christmas dinner on the beach with my Australian family would be something great, too, although I still have a difficulty imagining Christmas in summer. Gorgeous block! I would spend Christmas wherever my family happened to be. Our kids are spread out all over the world right now~ would love to be able to get them all together. Thanks for the fun! At the risk of sounding cheesy, I want to spend Christmas wherever my kids are! And since they are scattered about, maybe either where my older son will be at Christmas (Scotland) or where my younger son will be (Disney World). Thanks for the giveaway- beautiful fabrics and a great block. I would spend Christmas with my family in Scotland and would love having a winter Christmas again! A New Zealand Summer Christmas (although still special) misses a few vital ingredients. Since I just got back from living overseas for 4 years I'd just like to spend Christmas with my family! I'd love to go to Australia and have Christmas in the summer. What a change! If I could choose absolutely any place in the world to spend Christmas, it would be with my mother at home. We absolutely love having the family here - all generations from Mom to the great grands. I would love to have Christmas where our son was with us- he has moved to the other side of the continent and it is just too expensive to fly home for Christmas. Being with family is the most important part of Christmas. Your pattern is lovely and so are the Parisian fabrics- Paris is a lovely place. I would spend it at a mountain lodge some where in Montana with all of my family and a roaring fire in the fireplace. We have talked about doing that for the past few years but never seem to find the money at that time of year. Maybe next year. I would (and do) spend Christmas with our extended family. It's only a couple hours drive and that's where we go on Christmas day. We do have a small family supper and tree time at home on Christmas eve. I love your block and your fabric choices. I would like to spend Christmas in Australia. Your block is gorgeous!! My favourite place to spend Christmas is in Northern Ontario in my childhood home with my big family. I love being with them and sharing this holiday together.I wish I could go every year. But we don`t always get to go. Thanks for the wonderful giveaway! My favorite place in Kona Hawaii. One of my 6 children live there and are associated with Yout With a Mission. He, his wife and 3 chiildren are part of the reason as well as YWAM. I don't mind it not being cold in Dec. Your blog is just rich with lovely patterns. I had to add you to my list of blogs. I guess the place I'd like to spend Christmas is anywhere that my family can spend it with us. Right here in Maine is okay by me. but maybe in some other lifetime, I'd love to spend it in Switzerland. I absolutely love your patterns!! I would love to spend Christmas in the Bahamas with my hubby. What a wonderful giveaway! I love paper piecing. I am a vary happy follower of your blog. Thanks for the chance to win. I would like to spend Christmas with my family in New England! I would love to spend Christmas in Hawaii. Now that would be different! Thanks for the contest. Love your fabric and the gifts. Congrats on being one of the chosen. I would love to be anywhere at Christmas as long as I am with my DH. I would spend Christmas in England if I could pick anywhere. I was there in December many years ago, and it was wonderful to see the lead up to Christmas in the shops. I love, love this pattern as Christmas is my favorite time of year! I would spend Christmas with a family that didn't know our customs! I would love to show them how to trim a tree, share a turkey dinner, decorate homemade sugar cookies, and the very best part....hanging handmade stockings and seeing them filled with special surprises on Christmas morning! Spend Christmas anywhere???? Hmmm...I think it would have to be in the mountains of New Hampshire, Maine, or Vermont in a cozy cabin on a lake...and I'd have all my family there. At home with family. Thanks for the giveaway! I would love to spend Christmas at a snowy mountain lodge as long as my family could all be there, too. Your presents block is awesome! I'm so glad to have discovered your blog and your wonderful patterns. Greetings from Australia! I would love to be in Salzburg on Christmas Eve and join in singing "Silent Night" at midnight. Love your block...very unique!! I would like to stay in a snowy mountain lodge with all my family! But then, Home is just as great! Just wish I could have snow every year! Alabama is not so great a place for snow. I'd spend Christmas in Rome, Italy hoping I'm dressed warmly enough to walk around the ancient city when the fountains freeze and marble dolphins spout icicles. Everything is just perfect...the pattern and the fabric. I would spend Christmas Christmas at home. There's no place like being home for the holidays...especially when you're surrounded by family. Love the fabrics and pattern! I would spend Christmas in a warm place. Doesn't matter where. It always snowing where I live. Thanks! Wonderful pattern and fabrics! Thanks for the opportunity to win! 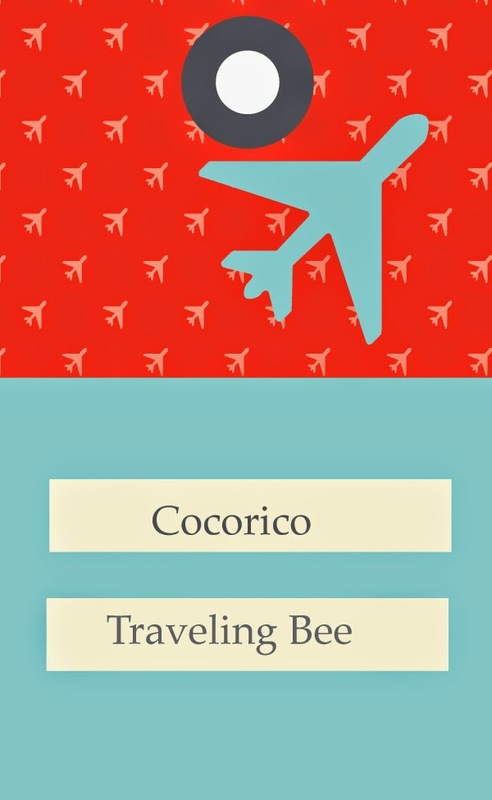 Where to spend Christmas anywhere in the world? Hands down, I'd go up to a cabin near the Wilderness area of Idaho, snowshoe in (with plenty of provisions), light a fire, have plenty of family and friends along, and Celebrate in the natural beauty of this good Earth. Where would I love to spend Christmas? Would you believe Mississippi? Why you asked? That is where my grandchildren are...and of course, their parents. What is more fun than little kids on Christmas morning? I would like to be somewhere warm! Maybe Christmas in Australia! I would love to spend Christmas in Hawaii. That present block is stunning! As for where to spend Christmas...at home with family definitely! I would spend it with my I laws lol. What a beautiful block. If I could spend Christmas anywhere in the world I would still choose at home with my family. I would love to go to Paris with my family and celebrate Christmas! thanks! I loved Xmas in Vancouver... I'd do that again in a heartbeat! Love your presents and what a great idea to spend it in Paris! I'm from Alaska so I'd love to go back for Christmas. As far as some place I've never been, I'd love to go to Switzerland. My Mom went to school and lived there when she was young and I'd love to go see where. What a lovely block, Charise! Okay, now back to the "assignment." 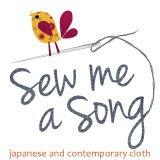 I'd spend Christmas in Tokyo and stay on for the Quilt Festival in January, of course! Really great block. Terrific idea. Where to spend Christmas if I could go anywhere? Tough one but I guess I would have to pick sitting on the beach in Maui. I just love being at the ocean. I would like to spend my Christmas in North Pole!! But the most important for me is not the place where I will be, but being with my family! I'd love to spend Christmas in Ireland. Heck I'd go any time of the year! I love your block! And great things in your giveaway! I love Christmas in NYC. I'd have to pick San Francisco since all my family is there and we don't get to see them too often! This is a cute stack of gifts! Now that I have grand children - they make wonderfull Christmas time. Congrats on making one of the top blocks on Madamm Samm's and rightly so. I love your piece. I realize I am too late for your giveaway, but I just wanted to congratulate you on being one of the top blocks! This pattern is stunning. Thanks for sharing it with us. Charise, your paper piecing is spectacular. The block you shares is awesome, as is the fabrics. I know I am too late for your giveaway but I would love to spend Christmas wherever my Grandones are. Thanks for sharing and happy stitching!! Like all your paper piecing blocks! Fabulous job. Thanks for sharing. that block design is fantastic, Charise. you are on fire!